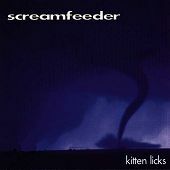 Brisbane, Australia's Screamfeeder is a three-piece pop band that can be melodic and abundantly catchy while also maintaining a bouncy rock rhythm throughout. One listen to their album will be all you'll need to become hooked. The opening line of "Static" will have you hooked ("I'm going to built a radio out of static from the stars"). The song abruptly starts off rocking, then slows down for the above-mentioned line, and then rockets off into some more power-pop that will make you bounce, sing-along, and spin your head in amazement. "Dart" is another pop number that has the rock rhythm section overtime while also making sure the melody is the first thing that grabs your attention. Female backing vocals help shake things up, which gives you an even warmer reason to keep listening. "Explode Your Friends" slows things down a bit, but keeps things heavy on the guitar and rhythm front. Less bouncy pop, but still a hook or two to keep you listening. Then there is the jump-and-smile action of "Summertime," another bright point on the record that will ensure you're enjoying yourself. Already on their way to indie cult status in Australia, with an album this delightful it will be no time at all before they're making a name for themselves in the U.S. This album is a nice power-pop album that will keep you smiling, singing along, and, most importantly, enjoying yourself. I'll give it an A-.